Klecker’s Heating & A/C, Inc.
What are the benefits of a radiant floor heating system? ➤ Comfort. Radiant floor heating creates a warm, even heat that is very pleasant feeling even when the weather is warm. ➤ Heating source for rooms where ducts cannot be run. Radiant floor heating also is an excellent heating source for rooms where traditional ducting cannot be run—or where you don’t want to deal with the inconvenience of a duct. ➤ Saves you money. Radiant floor heating is more energy efficient than baseboard heating, and doesn’t lose energy through heat loss like forced air systems. Install your radiant floor heating system with a programmable thermostat, which lowers your energy bills. 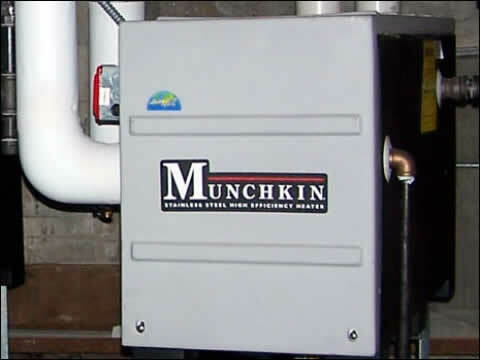 If you have a hydronic heating system in your home or are planning on installing hydronic heating in your new home, radiant floor heating can prolong the life of your high-efficiency water boiler by heating at lower temperatures. ➤ Allergy friendly. For people who suffer from allergies, radiant heating is a welcome alternate heating source because it doesn’t circulate allergens like traditional forced air systems. Can I install underfloor heating in an existing house or does radiant floor heating installation have to be part of a new build? The good news is that radiant floor heating, also called underfloor heating, can be installed in an existing home, or can be included in plans for your new home. 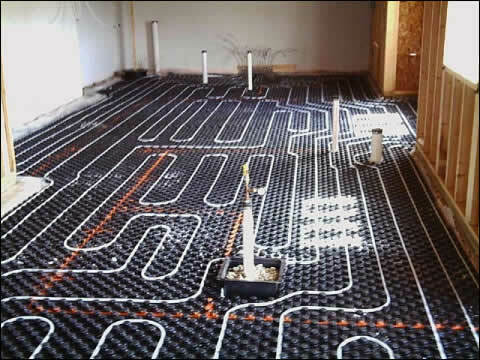 Radiant floor heating can be installed in a home heated by a water boiler (hydronic heating), with water pumped from the water boiler to radiant floor heating lines. If your home has forced air, radiant floor heating can be installed with an electric pad. If you want to lower your energy bills, install your flooring with a programmable thermostat. • Tile - any kind! If you’re considering radiant heating, make sure you consult flooring experts to make sure you select the right flooring and pad (if necessary) that amplifies the warmth of your radiant flooring. Then, sit back—or lie down—and enjoy the warmth of your cozy, warm, energy efficient floor. What is the cost of a radiant floor heating system? • Whether you are retrofitting a home or installing radiant floor heating in a new build. • How large of a space you are installing the system in. • Whether you are using hydronic heating or an electric pad. If you are trying to estimate the entire cost of installing a radiant floor heating system in your home, remember to include the cost of flooring and padding, if needed. Other costs that may need to be figured into your total bill include trim/baseboards and the cost of a new water boiler (if needed). Call 920-261-9218 or use our contact form. Copyright © Klecker’s Heating & A/C, Inc.. All Rights Reserved. Designed and Hosted by Badgerland Marketing. Klecker's Heating & A/C Services are offered throughout Dodge County, Jefferson County, Waukesha County and the surrounding areas including Watertown, Jefferson, Johnson Creek, Lake Mills, Waterloo, Beaver Dam, and Ixonia.